In the summer of 2007, one of the greatest natural disasters in the history of Greece occurs; extensive forest fires in many parts of the country will turn into ashes more than 2.5 million hectares of forest and fields, causing an enormous ecological disaster and the death of 63 humans. From August 23 until early September 2007, came Mount Parnon’s turn. The great forest fire burned around 39,000 hectares of mixed forest of Black pine, Fir and Aleppo pine, 19,000 hectares of which were Black pine forests, a forest type with a slow particularly regeneration rate. 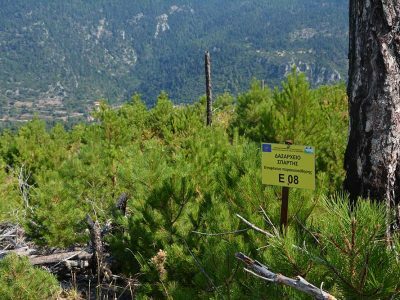 This enormous area, along with the burned areas during the same period on Mount Taygetos, represent more than 3% of the area of Black pine forests within the protected areas of the European Natura 2000 network in Greece. Black pine tree that was saved from the 2007 fire, surrounded by natural regeneration and planted trees of black pine. 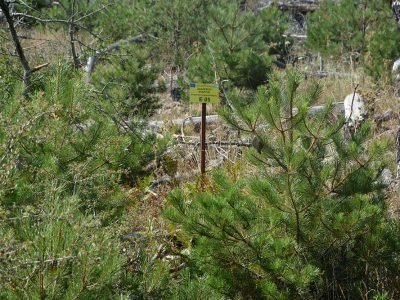 The following year, the Forest Service of Sparti, the Greek Biotope-Wetland Centre, the Management Body of Mount Parnon and Moustos Wetland, and the Directorate of Reforestation of Eastern Macedonia – Thrace began a great effort to enhance natural regeneration through the design and implementation of a 5,300 hectares Black pine forest planting program. 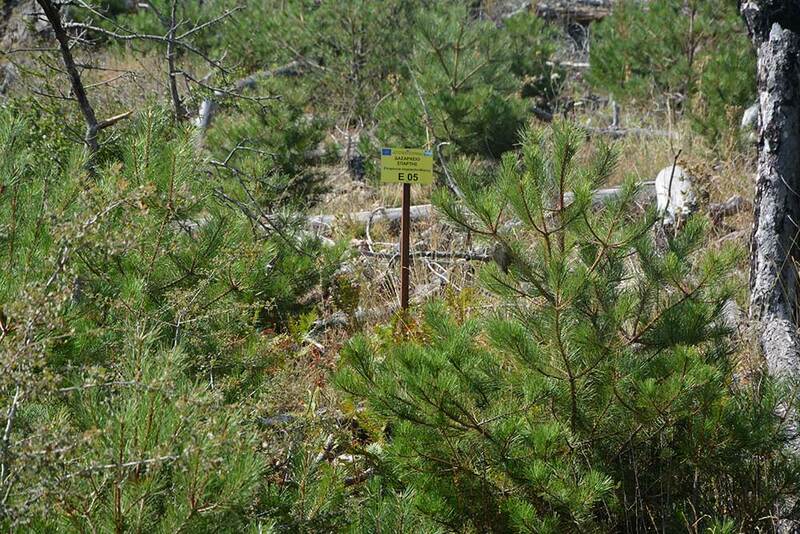 The first phase of the program (design and 2,800 hectares plantations) was implemented within the framework of the LIFE PINUS project “Restoration of Pinus nigra forests on Mount Parnonas (GR2520006) through a structured approach” and was funded by the LIFE financial instrument of the European Community and the Directorate General for the Development and Protection of Forests and the Natural Environment. 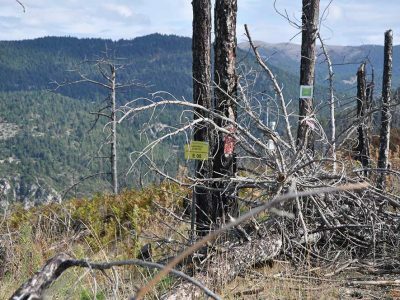 The restoration of the remaining 2,500 hectares of the burnt forest was funded by the EEA through the project “Restoration of the forests on Mount Parnonas and conservation guidelines for Mount Taygetos in Lakonia“. Today, 10 years after the devastating fire, the Black pine forest covers the slopes of Parnon again, at a slow but steady rate. 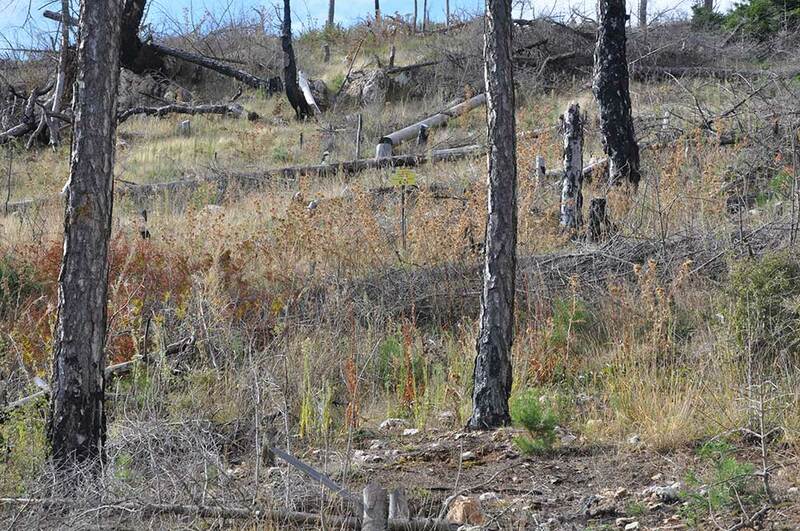 The burnt slopes opposite Polydroso (Tzitzina) are becoming green again due to the growth of Black pine and Fir, rending the results of this collective effort tangible, emitting a strong message of the possibilities offered by realistic and scientifically solid design and cooperation with the local community. 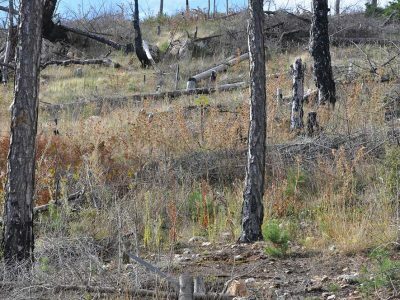 This effort shows that forest restoration is a particularly demanding process, even under ideal conditions of funding and cooperation; subsequently, there is an urgent need to step up efforts at preventing forest fires at all levels. 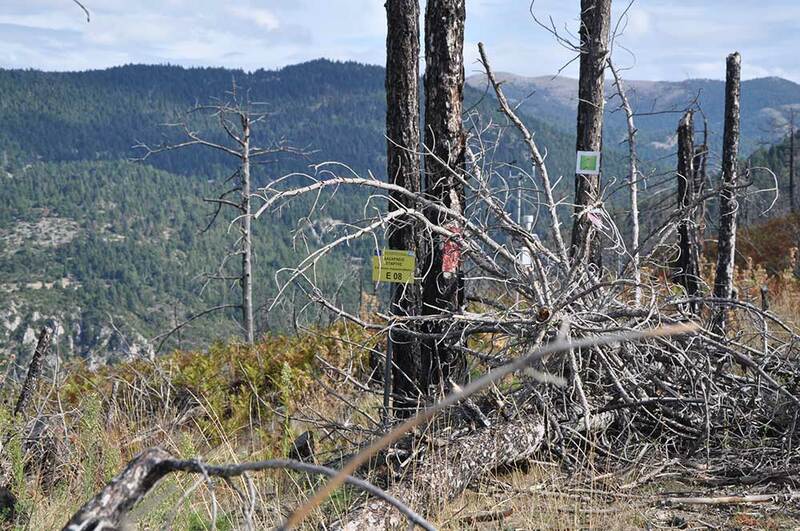 A restoration monitoring area of Parnon, on 2012. The same monitoring area, on 2017. 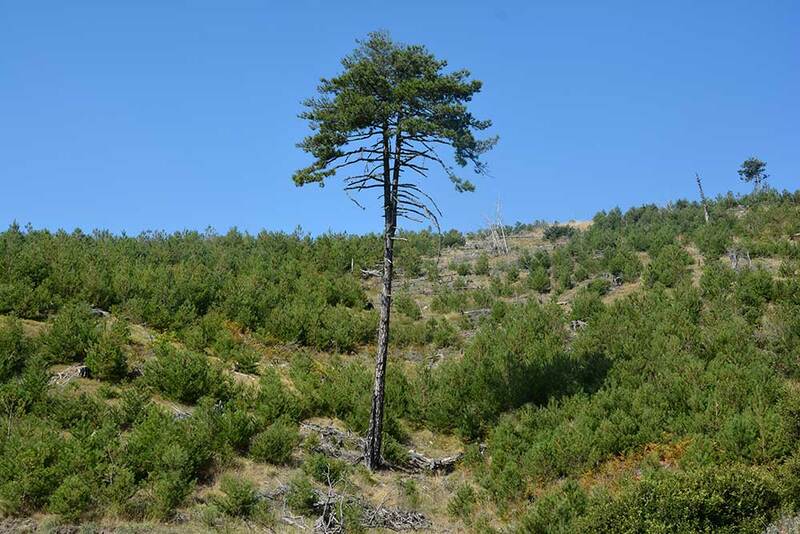 Detailed information on the LIFE PINUS project can be found on the project website www.parnonaslife.gr. 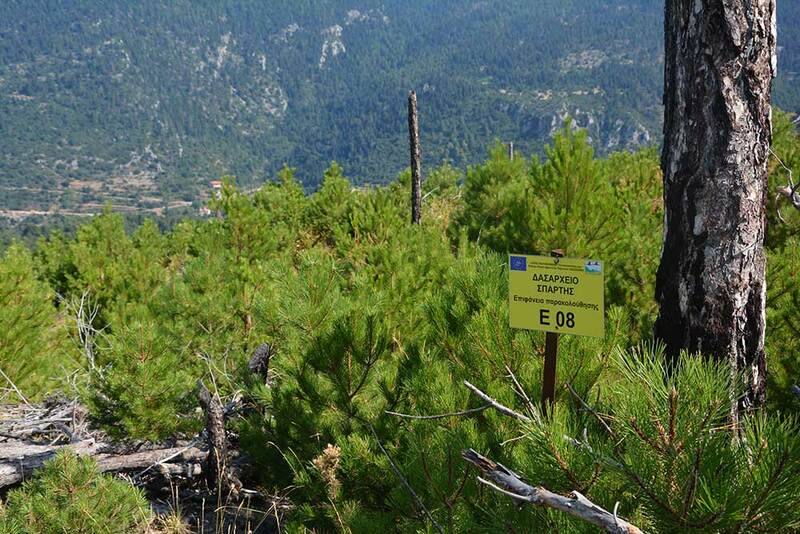 The movie “The Seed’s Journey” which focuses on the restoration of the forest can be seen also on the project website: http://www.parnonaslife.gr/el/the-travelling-seed.